The psychologist Mihaly Csikszentmihalyi (1990) has described focused attention as “psychic energy”. Like energy in the traditional sense, no work can be done without it, and through work that energy is consumed. Most of us have experienced a mental/emotional state where all of our attention (or energy) is totally focused on an activity. Csikszentmihalyi (1990) named this state “flow,” based on how participants in his studies described the experience. The elements associated with the flow state can be classified into the three areas; 1. Causes of Flow 2. Characteristics of Flow 3. 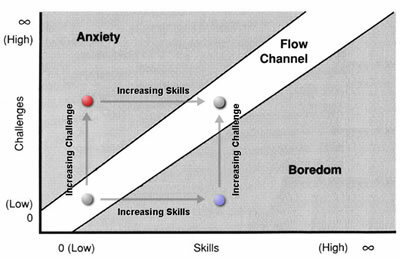 Consequences of Flow (Novak, Hoffman and Yung, 1999).